During a wedding, emotion overflows. Emotion is demonstrated in tears of joy to laughter during the minister’s message or the Maid of Honor’s toast to the couple. I doubt that I will ever forget the toast where the Matron of Honor (the bride’s sister) told of a heartfelt story when the two were little girls and the bride gave her sister five dollars to buy a doll). The Matron of Honor had everyone laughing with tears of joy when she handed her sister the $5 from when they were little girls. Oh, the joys of a good heartfelt wedding toast. Capturing the flowers, special dinnerware, and all the beauty of the decorations, table linens, and mementoes at a wedding are challenging but brings out the artist in me as a photographer. Capturing the beauty of the cake cutting utensils to the beautiful special ordered flowers is always a challenge and thrill as a wedding photographer. I look at each cake cutting utensil and think about how much time was spent deciding what to purchase and use for this special day. I doubt that I will ever forget one flower that was a special flower that the bride wanted. When she walked into the room that contained the flowers and saw them, she broke out in tears of joy and gave the florist a huge hug. Nor will I will ever tire of watching the groom and photographing his look when he sees his beautiful bride (his princess) walk down the aisle all adorned and glowing. Oh the emotions that flow when I see the father of the bride walk arm in arm with his daughter as the dad prepares to hand over his little girl to her groom. 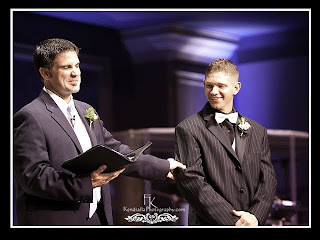 This part of the wedding ceremony always brings back the day when I walked my daughter down the aisle to give her over to her future husband. I cried all day and still cry when I think of the day. No longer will I be the most important guy in her life. As a photographer, I am able to capture for all of history, this very special moment in their life. The dad handing over his little princess to her groom that promises to love and protect his little girl.